Maybe my standards are low since I haven’t seen an NBA game for a few months, but this was the most exciting exhibition game I ever remember watching. The fans in London were treated to a great show. 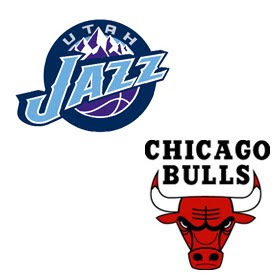 In a back-and-forth contest that remained relatively close throughout, Chicago hit a shot at the buzzer to beat Utah 102-101, handing the Jazz their first loss of the preseason. - The NBA TV announcers were terrible. They mentioned at least seven or eight times throughout the game that the Bulls were playing without Derrick Rose, John Salmons, and Tyrus Thomas. Just so happened that the Jazz were playing without CJ Miles, Kyle Korver, Matt Harpring, and Kyrolo Fesenko, but at the beginning of the game the announcers stated that the Jazz were essentially at full strength. It was actually funny, because the ticker on the bottom of the screen was mentioning CJ Miles’ finger injury and pending surgery right about the time they made the "full strength" comment. Someone must have called their attention to it later, because they finally acknowledged CJ and his injury just before halftime. It was the 4th quarter before they also commented that Kyle Kover was not playing due to knee inflammation. They never said a word (at least that I heard) about Harpring or Fesenko. - The announcers also referred to Kosta Koufos multiple times as a rookie. C'mon guys, this is your profession. Do a little homework. - Millsap looked outstanding. He scored inside and out, rebounded, blocked a shot, had a steal, took a charge, and just played aggressively. He had one strong driving layup going to his left that really impressed me. I don’t remember seeing that from him last season. Boozer by contrast was a complete non factor. If this game were an audition for starting PF, Millsap won the job. - The Jazz missed Korver and CJ. The lack of an outside threat made things much more difficult for the offense. Ronnie Brewer and Andrei Kirlenko each airballed a 3-point attempt in the first half. - Airball aside, Brewer looked great. I expect further improvement from him this season. - Despite the fact that neither could hit a shot, Ronnie Price and Eric Maynor both looked good backing up DWill at the point. They both ran the offense, found open teammates, and played solid defense. Maynor showed a lot of poise for a rookie and could end up earning some minutes this season. 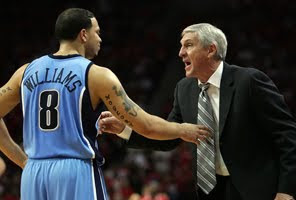 - At one point in the 3rd quarter, Williams fell awkwardly when running out to defend Hinrich. My heart sank as I flashed back to last year’s preseason game against the Bulls when he rolled his ankle on Derrick Rose's foot and ended up missing the first part of the season. Fortunately Deron got up and seemed fine. - This game was my first chance to see the 2009-10 version of AK. Not sure what’s up with the hair (although I could say that every year), but his new build is legit. He apparently gained 20 pounds of muscle over the summer, and it shows. Fortunately it didn’t appear to affect his quickness on defense, as he had 2 blocks and 2 steals in only 19 minutes. - Chicago has some good rookies. Taj Gibson was one of two players available at #19 that I had hoped the Jazz would select in this year’s draft (the other was Sam Young, and he didn’t get picked until the 2nd round). The Bulls took Gibson at #26, and I think they got a steal. They also selected James Johnson at #16 (I hoped he would slip to the Jazz but didn’t expect it), and he looked outstanding yesterday. He hit the winning shot at the buzzer to cap an 18-point outing that also included 8 rebounds and 2 blocks.